Will a pet door stop my dog from chewing? A pet door can help get chewing problems under control, but it depends on why the pet chews. 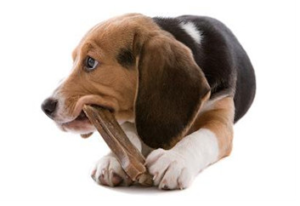 Puppies and adult dogs chew for different reasons. A teething puppy may have an itchy or aching mouth. That’s a problem that will grow away, and it can be managed by appropriate chew toys. An adult dog chewing on things is usually bored. A dog door can alleviate some of that boredom through offering access to another environment – the yard – with a new set of sounds and smells, but a dog can be just as bored outdoors as indoors. Thus, the pet door might not solve the problem on its own. Try to also increase play time and add some thinking-type games such as food puzzles to stimulate your dog and get the problems under control. It is nearly impossible to exercise a dog tired – it is much easier to make their brains tired. If you know your dog likes chewing, consider investing in a chew-proof door. It is a higher cost up-front, but will save you a lot of money in the long run. Call our customer service at 800-749-9609 to discuss! Check out our free World of Breeds e-Book and other great downloads! We have installers in all 50 States and Canada. © Copyright 2019 Pet Doors USA, Inc.